GM Hasn’t Learned, Is Still "as Dysfunctional as Ever"
Jean Halliday from Advertising Age: General Motors said it wasn't going to do corporate ads — and then it put Chairman Ed Whitacre in its multiple-model "May the Best Car Win" campaign. The automaker also said it was going to create distinctive advertising for its four remaining vehicle brands, Buick, Cadillac, Chevrolet and GMC — but tell that to subscribers of Newsweek and BusinessWeek. Charlene Sadler from CBC News: Historians reviewing what went wrong with Saturn shouldn't blame fickle consumers for turning their back on a brand trying to do things differently, says an automotive marketing expert. 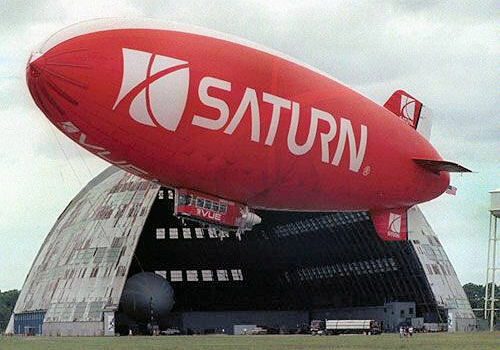 Saturn's early television and print ads were quirky, offbeat spots that often focused more on the emotional side of owning a car, rather than talking about latest models from Saturn. But in a clever, indirect, and very effective manner those first ads were very much all about Saturn, and how owning a Saturn could make you feel. Take this commercial that aired in or around 1992. Alisa Priddle from the Detroit News: Lutz is convinced advertising is the key. He compared the dismal sales of the critically acclaimed Saturn Aura, which was named North American Car of the Year, to the sales success of the Chevrolet Malibu, also a Car of the Year winner. 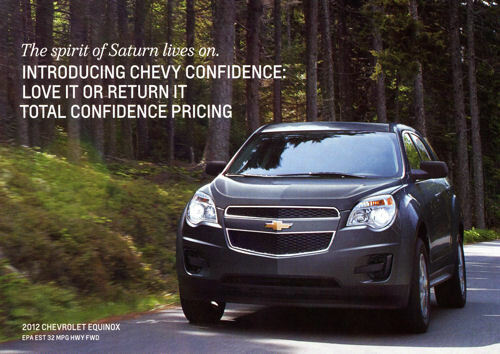 The difference: GM spent more than $100 million to advertise the Malibu, 10 times what it spent on the Aura, Lutz said. John Stoll from the Wall Street Journal: To spark interest and remind consumers that Saturn is still alive, its dealers have kicked off a new marketing campaign built around the slogan, "Wonder where the car business is headed? It's here." The slogan will be used on banners across Saturn storefronts and in a spate of email blasts, Facebook blogs and direct communications with buyers. Retailers who attended this year's National Automobile Dealers Association (NADA) meeting in San Francisco, received a reassuring, but challenging message from company executives: GM expects its growth in North America over the next five years to come from Saturn. There are currently 8 users and 434 guests online.